If the launches of various new-media entities over the past year — from Beacon’s crowdfunding efforts and Syria Deeply’s topic-focused site to Ezra Klein’s Vox project and Jessica Lessin’s The Information — it’s that there is no end of experimentation going on when it comes to business models. But can a not very well-known blogger with no team behind them turn their writing into a successful freemium business? 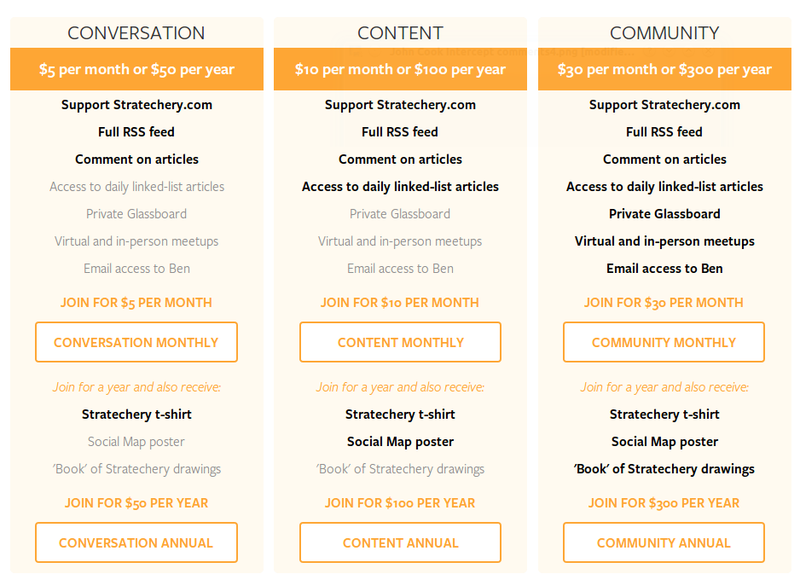 Technology analyst Ben Thompson is determined to try: he launched a new membership-based model on his blog Stratechery this week and I talked with him about what he is trying to do and why. Thompson is a former business development and marketing manager with Automattic, the company behind the WordPress blog platform, and has also worked for Microsoft in a similar capacity. Over the past year, he has developed a following for his long and thoughtful posts about technology companies such as Box and Apple, and the strategic thinking (or lack of it) behind their businesses — and it’s that following that he is now trying to monetize. Instead of a simple donation-style paywall, similar to what Andrew Sullivan has done with his site The Daily Dish (which has raised close to $1 million over the past year), Thompson has a series of membership tiers that are designed to offer different levels of experience and content, on top of the daily and weekly articles he writes for the site (which remain free). The tier that is $3 a month or $30 a year includes the ability to comment, a full RSS feed and a T-shirt, while $10 a month gives readers all of that plus a poster and access to a daily email of article links. Thompson said he is also a big believer in the single-voice blog, and he is concerned that some of the newer entrants in the new-media world — such as Nate Silver’s FiveThirtyEight site — have lost sight of what made them successful. Whereas every post and link that Silver used to publish had his voice and carried a certain brand expectation, Thompson said that identity is no longer as powerful because the site has broadened out into so many different topics. Thompson, who said he has been thinking about this project for years, said that much of his inspiration for Stratechery came from John Gruber’s Daring Fireball site, which is run more or less single-handedly by Gruber, and has become extremely successful with only a relatively small amount of advertising and sponsored content (Thompson points out that Gruber was one of the unsung pioneers of sponsored content in new media with his sponsored RSS feeds, which he introduced a number of years ago). While Gruber has a big enough following that he can survive solely on advertising and doesn’t need to offer memberships, Thompson said he is trying to balance his new venture out by using a number of different monetization approaches: one is membership, another is sponsored content (each post has a sponsor mention at the bottom), he is launching a podcast that will contain advertising, and is also accepting speaking engagements and may do other personal events. And while Kevin Kelly has written about the concept of “A thousand true fans” being all an independent artist needs to survive, Thompson said that based on his calculations about the combination of advertising — he says he is currently getting about 40,000 unique visitors a week — and memberships, he needs “significantly less” than a thousand subscribers in order to consider his site a success. Other sites that have taken a membership approach include Techdirt, which started as the personal blog of founder Mike Masnick and has become a business — with much of the value derived from the commenting community on the blog, which businesses can tap into for market intelligence. Techdirt’s membership layer includes things like early access to posts and the ability to take part in special forum discussions, as well as personal time with Masnick.